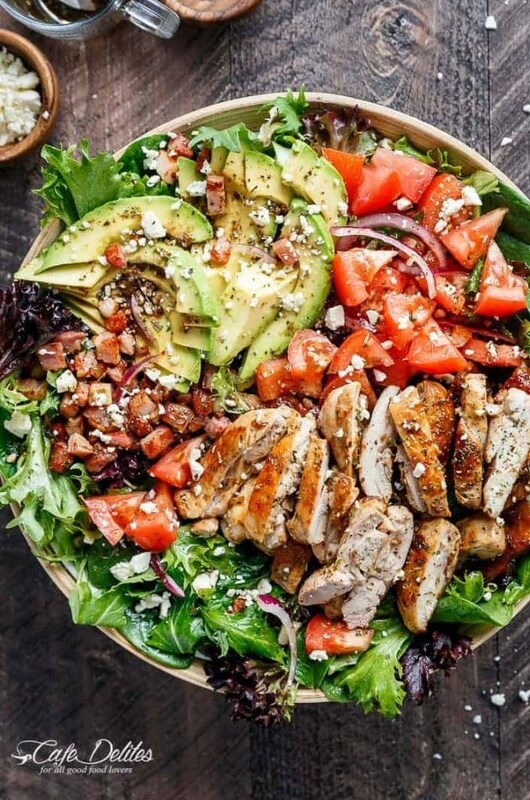 BLT Balsamic Chicken Avocado Feta Salad is a delicious twist to a BLT in a bowl! With a balsamic dressing that doubles as a marinade you won't even miss the bread in this mega loaded salad. Cook chicken fillets until crisp and cooked through (about 7 minutes each side). Arrange all salad ingredients in a large bowl. Top with the bacon, chicken, avocado and sprinkle with feta, extra Italian seasoning and salt and pepper to your tastes. Drizzle with the remaining dressing, and serve.